Welcome to Mexico City, Homing Bird's Allure Condesa CDMX. Just a few steps away from some of the metropolis' best. This beautiful 2-bedroom apartment is part of the Roma Norte neighborhood, one of Mexico City's most cosmopolitan areas. The master bedroom comes equipped with a king-size bed and a full bathroom. The other bedroom has a queen-size bed. The unit also has a fully stocked modern kitchen and a 4-person dining room set. The living room becomes the perfect space where you can enjoy some downtime on our very comfortable sofa while watching Netflix on a flat screen Smart TV. One of the main attractions this apartment offers is, without a doubt, a gorgeous roof garden with swimming pool, gym, sauna, playroom, and of course, a sweeping view of the Mexico City. It's a great location that facilitates access to the city's most important places to visit. Tranquility and luxury will be the highlights of your stay. Close to the best parks, bars and restaurants this city has to offer. For the best “big city experience,” why not come to the largest city of them all. Upscale comfortable spot great neighborhood safe and close to lots of great restaurants parks and distractions. Comfy beds functional kitchen. Perfect for our family of 4 adults. Boys shared a king. This apartment suited us well. It's in a nice building and the location was great. The beds were pretty comfortable, good water pressure in the showers, and the unit had a hair dryer. Down sides - no AC, no laundry, and there's no tea kettle/pot. Concierge was helpful. There is a dog in the unit next door who barked a lot as we were coming and going but not too bad once we were inside the unit. The front steps were being redone when we were there so we had to go in and out through the parking garage. Also, most of the other amenity spaces were also closed for repairs. Not sure how much of this is earthquake related but we definitely didn't get to experience the roof deck as is the cover photo for this unit. The location was good and Daniela made good suggestion and booking for restaurants. She helped on arranging tours and airport pickups though we did find another driver at about 1/2 the price. Daniela told us that water would be provided. She brought the 1st 2 gallon bottle and we ended up buying the next 2. Take the boxes out of the closet and store water there. It's not the money but the inconvenience of getting them and hauling them up the stairs. The elevators were OUT for the entire 9 day. Hard to believe that in a 3 yr old building they could not fix them in that time. Thank heaven we were only on the 3rd floor. It was horrible for us and the stairs are not user friendly with their strange shape. NOT GOOD! I am 75 with week knees. The curtains were being pulled off the hooks since there was no wand to move the blackout curtains. Steve hooked the ones that were not broken. There really should be sheers for privacy not just the blackouts since the bedrooms get so hot it is difficult to sleep when the windows are closed against the noise from the street. Even with the windows open and the fans on it is difficult. Hard to sit 4 people in the living area with any comfort do to seating. Tiny place though the web sight does not look that way. One of the fans was broken and I am surprised that no one complained before. Daniela was great about buying another quickly but it made so much noise we could not use it. Only 1 dish towel and no extra hand towels for the bathrooms as they were being used for bath mats. There was extra bath towels which was good since 1 towel in each bath was dirty. Without a washer/dryer in the unit or building there was no way to even clean them ourselves. It would be good to provide bath soap, even little pieces. People bring all their personal stuff but not bath soap and dish soap would be good. Luckily other people leave odds and ends or we would have left the dishes in the sink. We would not go back or can't really recommend the apartment. Exactly as described. Great location and beautiful apartment. The apartment is beautiful and exactly as described. The host did a great job welcoming us and we enjoyed our stay in the Mexico City. Apartment is centrally located near great attractions and restaurants. I am glad that you had a pleasant stay with us, it has been a pleasure to receive you. We look forward to serving you again in any of our properties. Great location. Close to great restaurants and bars. We had a wonderful stay in Mexico City. This apartment provided us with everything we needed. We brought our 2 young daughters with us, had more than enough room for us 4 and never felt unsafe in this area. It was nice having the pool to keep them entertained. Walking distance to anything you want. The roof top has an amazing view and the complex is very well maintained! Erick was very helpful and made sure we knew we could contact him at anytime with anything we needed. 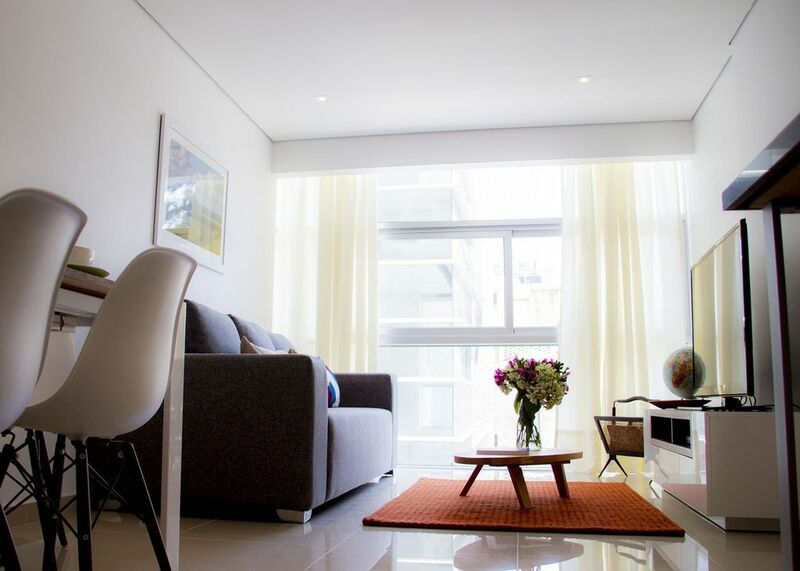 We would highly recommend this apartment for your stay in Mexico City!! The apartment was perfect. Two bedrooms, a king bed in one, a queen in the other, two baths, and a comfortable living/dining/kitchen space. The location in Roma Norte was perfect, quite central, and being in an apartment made us feel much more a part of the life of the city than if we had stayed in a hotel. Erick, our contact in Mexico City, was waiting for us when we arrived, helped us get oriented, and, when I stupidly lost the apartment key in a taxi, he brought a replacement immediately. There were two terraces, large windows, abundant sunshine, and the building itself was modern, clean, and had a rooftop terrace and an indoor pool. There were two of us, but it would work for a couple with one child or two small ones.